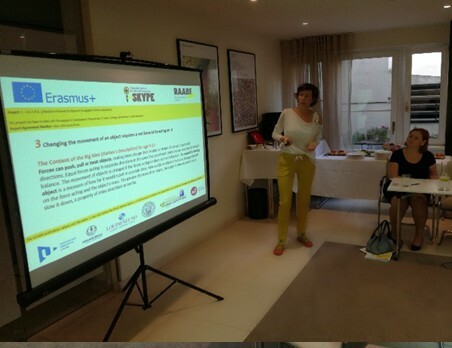 This is the second newsletter dedicated to the transnational project I – S.K.Y.P.E. that publishing house RAABE started to implement in October 2016 in cooperation with six other partners from three European countries – Slovakia, the Czech Republic and Germany. This is the way how we would like to give you all information what we have done so far in the project, how it is going to continue and what lies ahead of us. Since October 2016, the publishing house Dr. Josef Raabe Slovakia, based in Bratislava, has been implementing the transnational project I – S.K.Y.P.E. (Interactive Science for Kids and Youngsters in Primary Education) which is entirely focused on the support of the science-related subjects´ teachers in primary education. There are six partners from three different countries participating at the project together with us – Slovakia, Czech Republic and Germany. The main aim of the project I – S.K.Y.P.E. is to fundamentally influence the education system, both at national and European level, through the exchange of knowledge and experiences between schools, universities, science associations and the business companies. Primary school of J. Guth-Jarkovský in Prague was in charge of the organisation of the project meeting. The publishing house Dr. Josef Raabe Slovakia helped with the coordination of the whole meeting. In the following period, the project will continue with the improvement of methodical materials to prepare them for the testing and evaluation process at partner schools (Primary school with kindergarten of king Svätopluk in Šintava; Primary school of J. Guth-Jarkovský in Prague; Stiftung Louisenlund). Consequently, all the comments from teachers will be implemented into the final version of Methodical Teachers´ Handbook by partner universities. At the same time, we will start to work on the preparation of the pilot version of 2nd Intellectual Output of the project – creation of the scenario and programme of workshops for teachers of the science-related subjects in primary education. We wish you a very merry Christmas and happy and successful New Year 2018.